Instead of books, we lend games and toys! Play Library is just like a regular library. But it's totally different. It's pretty much the best place in the world. 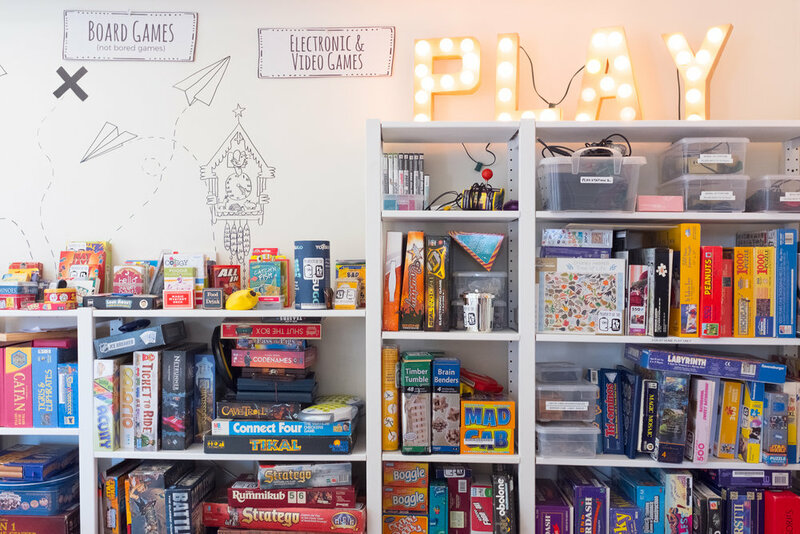 Designed for kids and adults, Play Library's goal is to connect families, friends, and communities through play. We offer over 1000 Games & Toys including: Game Night games, Gamery games, Toys of all kinds, Seasonal Outdoor Equipment (including new REI tents!) & Event Rentals (like giant Jenga, Big Wheels and so much more)! We also house Cincinnati's first Cincinnati Toy History Museum on-site! Let us Host your Birthday party, Baby shower, and Creative Off-site in our space! Please help keep Play Library™ a Cincinnati staple. Thank you to our members and donors for their generosity! Q: How can I be sure these toys and games are clean? Germs. Are. Gross. A: SO GROSS! Upon return, no toy is re-shelved until it is thoroughly cleaned. We use Benefect Botanical Decon 30. Q: Are all your toys and games hand-me-downs? A: Nope! We wanna carry all the hottest stuff you're looking for. Your membership and contributions make sure we have that stuff. We also accept previously-owned toys and games. Q: So, what's stopping someone from just returning broken toys? A: We understand that toys break and pieces get lost. Thankfully, we can either replace the missing piece, or the toy goes into the toy parts department to be made into a new toy! If you consistently return toys broken or with missing pieces, there will be a small fee and we’ll send you home with a puppy! (That’s a joke - we keep the puppy.) Likely, you will not be able to take a toy out again for a week. We think that’s fair. Don’t you? Join our mailing list so you know exactly what's up, where it's up, when it goes up, who's up with it, why it's so up, and how you can get down with it. We respect your privacy, and we aren't going to sell your email address. But, we might trade it for some really rad toys. Just kidding. Thank you! We'll send you no more than an email per week. Or so. But, we're fun, so it's worth it.